​English language education is an important part of the university’s fundamental education (kiso kyoiku) initiative. First and second year students take two classes a week: Listening & Speaking and Reading & Writing. The goal of the program is for students to attain functional proficiency in basic English by the end of their second year. ​The LERC currently uses a modified version of the Communication Spotlight series for all of its core Listening & Speaking classes. Currently in use are six textbooks, divided into three levels. Faculty have worked closely with the publisher (ABAX) to customize the textbooks so that they effectively address student needs and are aligned with program standards. Vocabulary instruction is an integrated part of the LERC English language curriculum. Over the course of two years, students learn and review 1600 words essential for English communication, as determined through analysis of the British National Corpus. The program contains a substantial self-study component which centers on a vocabulary notebook into which students organize words for study and review. In class, teachers draw attention to the multifaceted nature of vocabulary knowledge, drawing attention to not only the most frequent translations of words but also spoken forms, synonyms and common collocations. Quizzes are administered regularly to promote vocabulary review. From 2018, all first and second year students will use the KSU Wordbook, a vocabulary reference and workbook custom designed for the Kyushu Sangyo University LERC. All Fundamental English courses include a weekly e-learning component that is tightly integrated with the vocabulary and textbook components of the curriculum. It allows students to review content that was covered in class, to preview content in upcoming classes, and to help prepare for final exams. The e-learning content was created in-house by LERC faculty, and is specifically designed as an integrated element of the curriculum. This allows the LERC to alter the e-learning at any time to reflect updated curriculum content and to better address the needs of its students. Students and faculty can login to the e-learning here. ​The Career English program prepares students to use English in professional work settings, both within Japan and abroad. 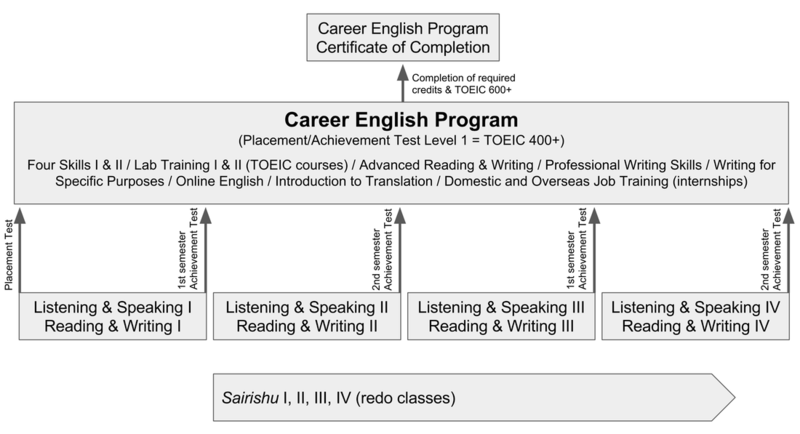 Students who complete the program and attain a minimum TOEIC score of 600 receive an official program certificate. Graduates of the program have found this credential to be an attractive addition to their academic CVs, particularly from the perspective of potential employers. The program starts with two compulsory courses: Four Skills and Advanced Reading and Writing. After completing these two courses, students choose from a number of elective courses. Two of these electives, Domestic and Overseas Job Training, include corporate internships that require proficiency in English.